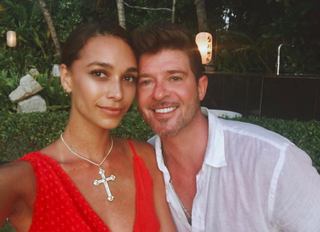 It’s been three years since actress Paula Patton kicked Robin Thicke to the curb after being together since they were high school sweethearts and getting married in 2005. Patton, who has said that Thicke repeatedly cheated on her, is still battling with the singer when it comes to custody of their 7-year-old son, Julian. After making a failed album, Paula, in 2014, in an attempt to get Patton back, Thicke found a newer model in the form of 19-year-old April Love Geary, who is now three months pregnant. Thicke, 40, and Geary announced the pregnancy on Instagram and noted that the baby is due on the birthday of Robin’s late father, Alan Thicke: March 1. Geary, now 22, joked on Instagram last year about the couple’s age gap, which some people apparently find odd. “We’re out here LIVING while most of y’all are still bothered by an age gap,” the model captioned her selfie.